As internet marketers, the wealth of data available is a gold mine for reaching the right prospects. For example, Facebook Advertising and Google AdWords can be more precisely targeted to the consumers we want to reach. As internet consumers, these same internet tracking conventions apply to us. As Peter Parker discovered in Spiderman: “With great power comes great responsibility.” And more than that – there is an ethics issue. While a “do not track” option is available on many browsers, it is not legally binding, and applications providers are free to violate it. The Digital Advertising Alliance instructed its members to ignore browser privacy settings in this statement issued in October 2012. Other than the ‘do not track’ option in web browsers, there are no viable ways for consumers to ‘opt out’ of online data tracking. In the U.S., there are no laws or regulations governing data collection and how it is used. Is this an issue to you, the consumer? Maybe. Let your elected state, local and congressional representatives know how you feel about unauthorized internet data collection for re-sale. For private online searches that are not tracked, use Duck Duck Go. We all live and do business on the internet. Technological advances and the ability to associate data across multiple sources is shifting boundaries of what is or is not PII (personal identifiable information), including potential re-identification of previously anonymous data. 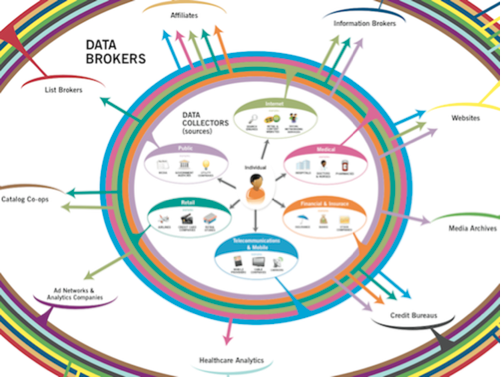 Online entities that track your data – sell it to the highest bidder. Usually, this results in ad retargeting. You could get classified as a meth dealer. ChoicePoint is a data broker that maintains files on nearly all Americans. It mistakenly reported a criminal charge of “intent to sell and manufacture methamphetamines” in an Arkansas resident’s file. ChoicePoint corrected the information when notified about the error, but other companies that had bought Taylor’s file from ChoicePoint did not automatically follow suit. The free-floating lie ensured rapid rejection of her job applications, and she could not even obtain credit to buy a dishwasher. Some companies corrected their reports in a timely manner, but Taylor had to nag others repeatedly and even took one to court. Little-known firms tracking data used in credit scores – Washington Post article, July 16, 2011. Atlanta entrepreneur….has access to more than a billion records detailing consumers’ personal finances — and there is little they can do about it. A family member searches the internet for funeral homes and resources to care for a recently deceased family member. For months later, each online use results in barrage of online ads for funeral homes, gravestones and more on almost all websites visited. Individuals searching the web for health information for themselves or friends (diabetes, heart disease, etc) have been denied insurance. Or have insurance premiums increased substantially as a result of the health searches. Buy cable “plus package,” get classified as plus-sized. Online purchase of plus size clothing – or other identifiable products related to a potential, but not verified, health risk – have resulted in insurance denial. Or searchers have experienced increased insurance premiums. Individuals conducting online research on health conditions (including pregnancy, substance abuse, degenerative diseases and more) are subjected to months of ad retargeting for the conditions researched. In many cases, this leads to unwanted reveals of the health condition to family members. Cell phone companies now track your movements through your cell phone signal and sell that data to the highest bidder. Current Privacy Issue: Although this information is theoretically anonymous – it can be decoded to reveal personal information and whereabouts. This allows advertisers to target ads to specific individuals for specific products. Future Privacy Issue: As an example, known extreme sports enthusiasts could experience higher insurance rates. Any who frequent locations deemed ‘unhealthy’ for a variety of reasons could experience higher insurance rates. 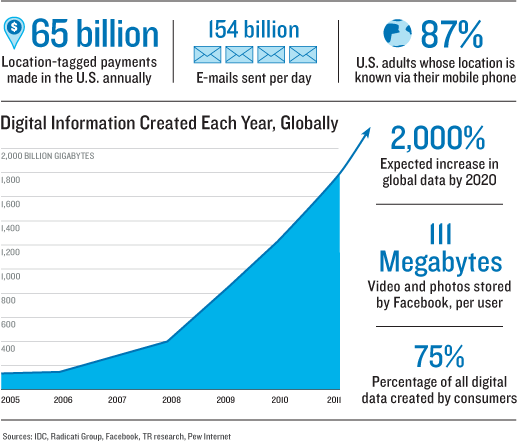 The definition of personal data is evolving. Traditionally, that definition was pre-determined and governed through the use of a binary approach: In most jurisdictions, the use of personally identifiable information (PII) was subject to strict restrictions whereas the use of non-PII was often uncontrolled. However, what is considered personal data is increasingly contextual; it changes with personal preferences, new applications, context of uses, and changes in cultural and social norms. Traditionally, organizations have used a variety of techniques to de-identify data and create value for society while protecting an individual’s privacy. Such data was not subject to the same rules as PII, as an individual could not be identified from it. But technological advances and the ability to associate data across multiple sources is shifting boundaries of what is or is not PII, including potential re-identification of previously anonymized data. 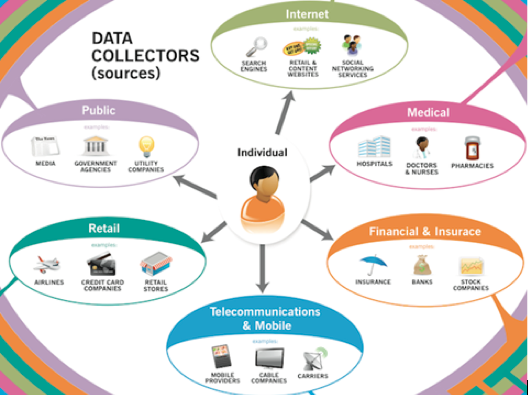 Credit: “Unlocking the Value of Personal Data: From Collection to Usage, Prepared in collaboration with The Boston Consulting Group” Emphasis added. “It is important to note that significant numbers of respondents said they did not know if some personal information about them was available online. For instance: 30% of internet users said they did not know if their email address was posted online; 22% said they didn’t know if their home address was posted; 17% said they didn’t know if their cell phone was posted; and 13% said they didn’t know if their political party, their writing, and their birth date were posted online. Users do not think current laws provide enough protections. Asked whether they think current privacy laws provide reasonable protections for people’s privacy on their online activities, 66% of all adults said the laws are “not good enough.” Some 24% said they provide reasonable protection. Let your elected representatives and senators know how you feel about unauthorized internet data collection for re-sale. Need Effective and Ethical Internet Marketing?